Today’s project is an oldie but a goodie (oldie as in I-made-it-in-January-but-haven’t-shared-the-tutorial-yet). I shared the tutorial over at Family Ever After for Rach’s Sew-lebrity series (sidenote, real sew-lebrities don’t have to sew with the sewing machine manual in their lap and You Tube on their sewing table… but it was so fun to be a part of Rach’s series). Anyway, I thought I’d share it here as well. 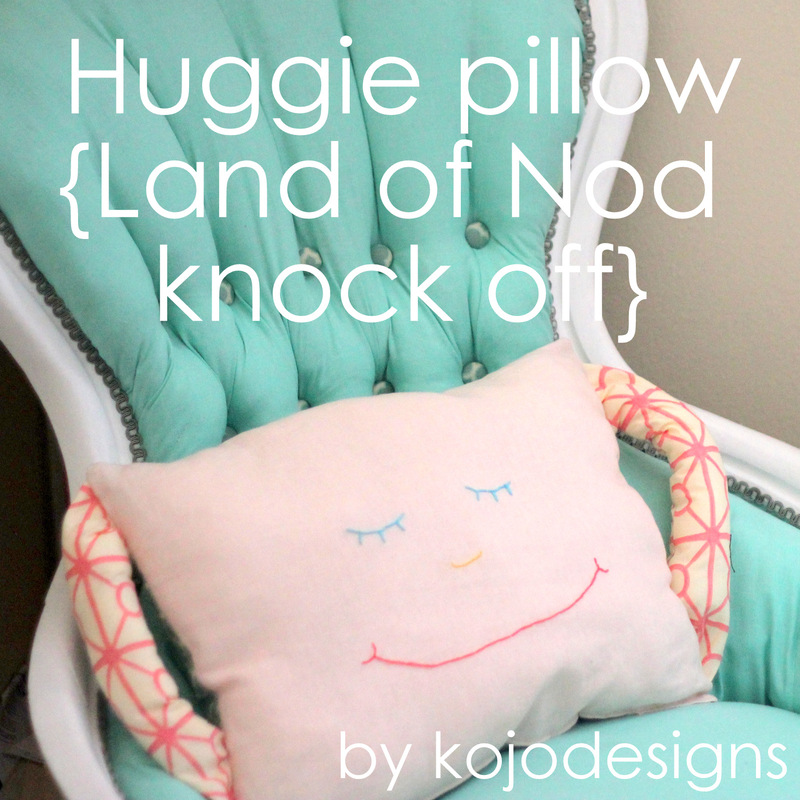 When I was working on the aqua chair for Piper Jane’s nursery, I saw this oh so cute Hold Me Tight pillow at Land of Nod. I love it. She needed something like it- so I made her one. Want to make one too? Cut out two rectangles, about throw pillow sized (is it terrible that I didn’t even measure, just eyeballed approximately how big I wanted them to be and cut?). 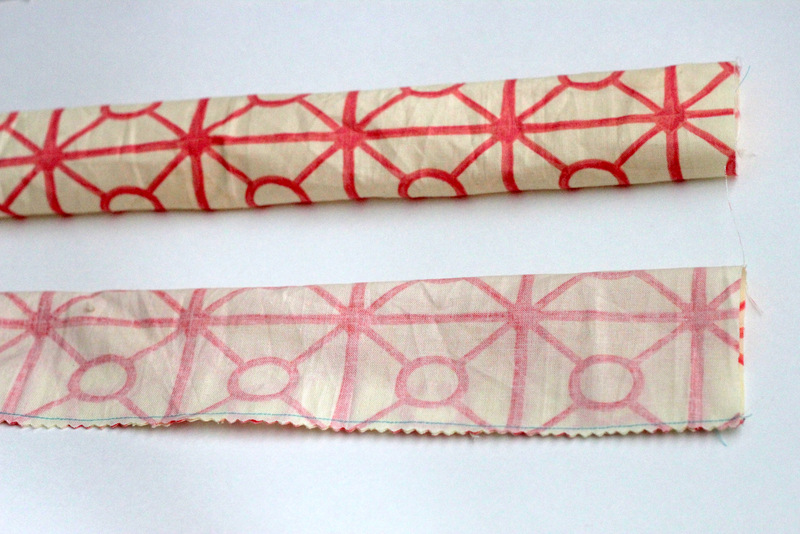 Also cut out two smaller rectangles from a graphic fabric (mine were about 5″ wide and 10″ tall). Embellish the main pieces as desired. 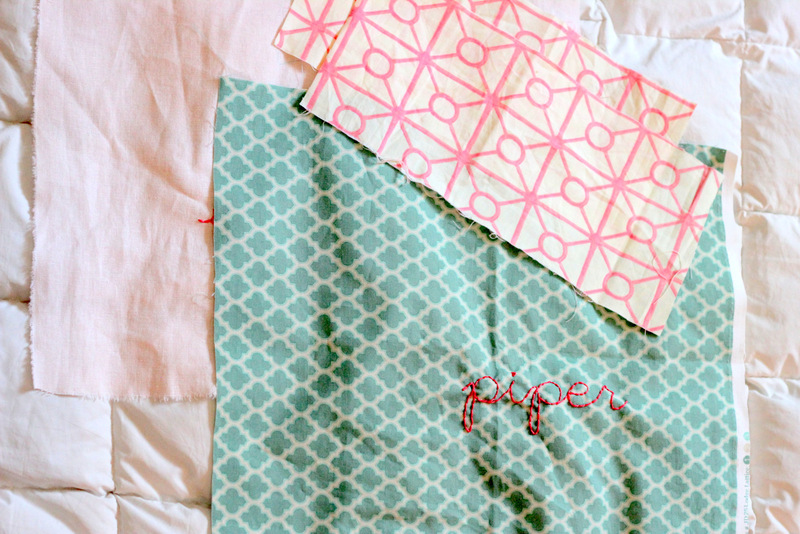 I embroidered “piper” on the patterned side and a little face on the pink linen side (for those of you who’ve emailed/commented with requests for an embroidery primer- it’s in the works and should be up soon!). 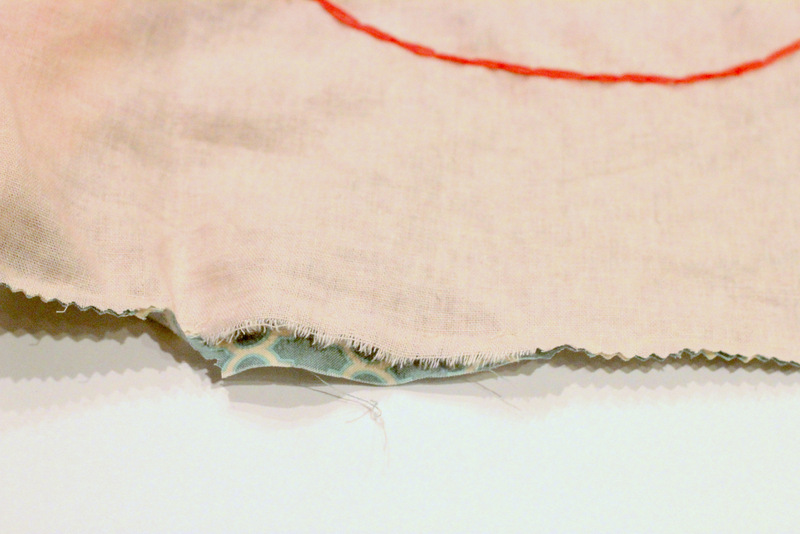 Pin the smaller rectangles in half, right sides facing in and stitch along the unfinished edge, making two tubes. Pinking shear the edges and turn right side in (these are your huggie’s ‘arms’). Stuff the tube with polyfil and pin the unfinished open edge along the right side of one of the main pieces. I pinned mine at an angle so that the ‘arms’ would sit right and not stick out at a ninety degree angle. Do the same with the bottom open tube edge. Repeat with the ‘arm’ piece on the other side. Pin the two main pieces together, right sides facing in, with the stuffed arm pieces sandwiched in between. Sew up the side edges, catching the tube ends in the line of stitching. 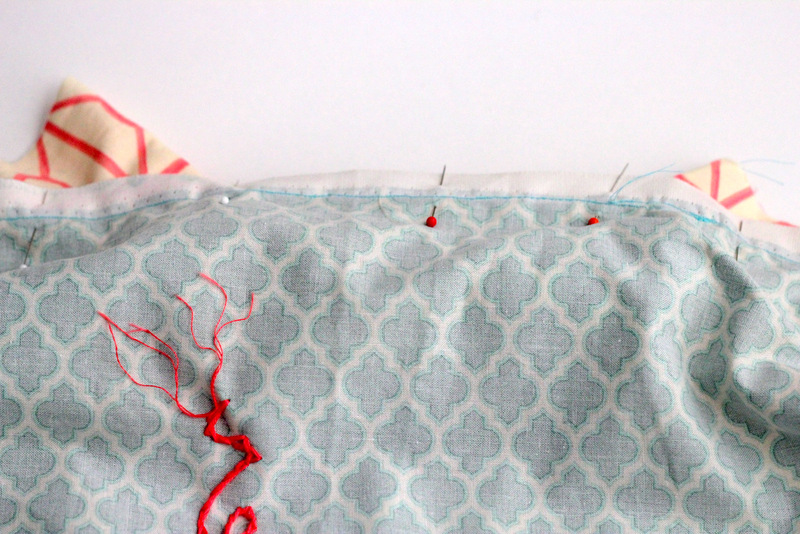 Continue stitching around the rest of the pillow, leaving a 4″ opening along the bottom edge. 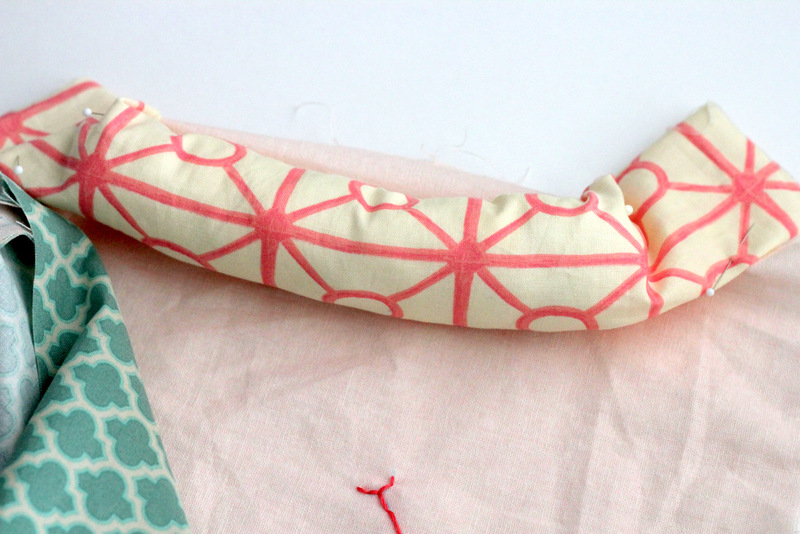 Turn right side in, pulling the pillow and the ‘arms’ through the 4″ opening. Stitch closed. DONE! 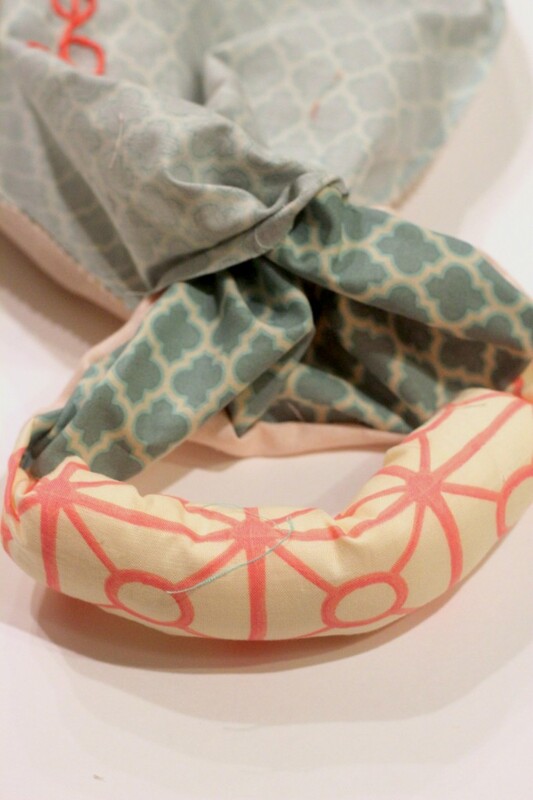 The perfect huggie for your baby girl’s girlygirly chair. ps- I can’t handle how small Piper Jane is in these pictures (and how little hair she has)! Whoa-grow-up-so-quick! I saw this the other day and fell IN LOVE!!! 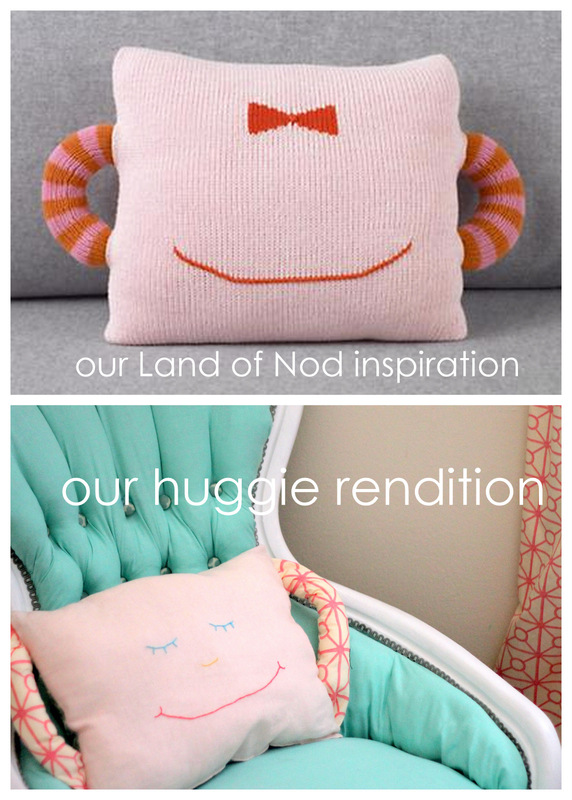 This has got to be the cutest pillow knock off ever. I hope you will consider uploading a photo of it into SewSet – a new on-line sewing pattern & tutorial search engine. I would love to have you incredible ladies in the directory so others can find you and the tutorials on your site when looking! This is simply fabulous. So nice! Wonder if my big guy will want one… Thanks for sharing! P.S. 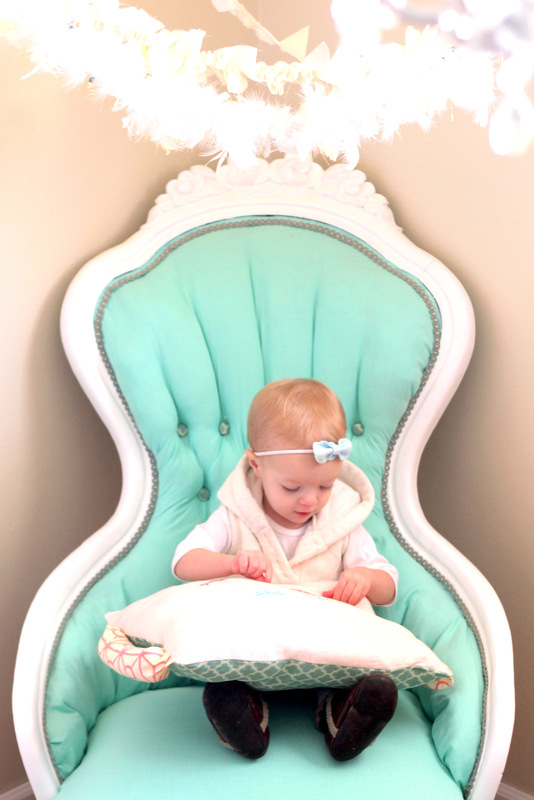 I love the girlygirly chair! A. I love your chair! B. I think this is so precious! 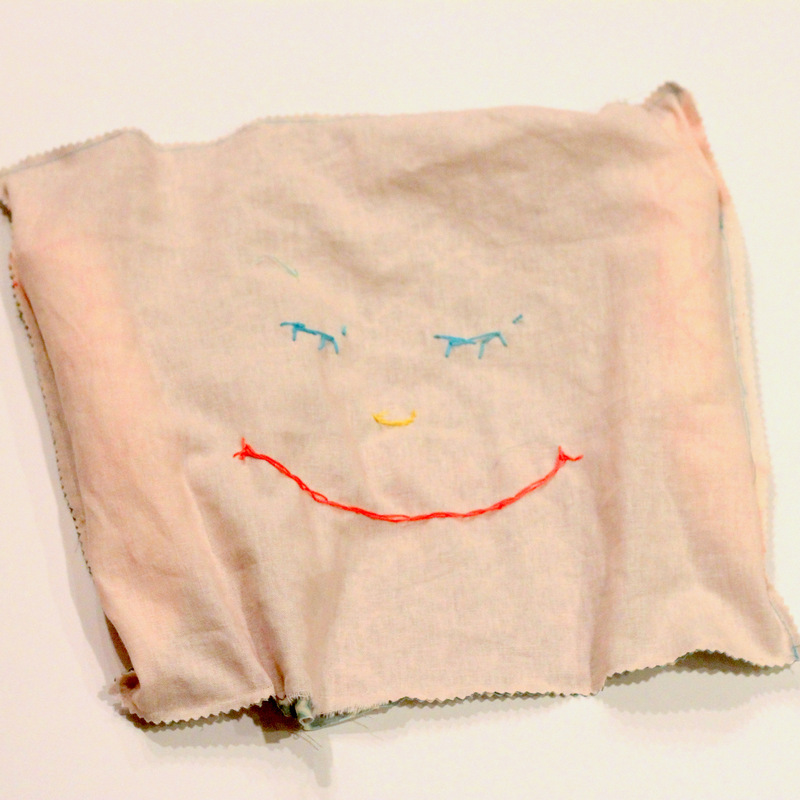 Actually I like yours a lot more than the inspiration pillow. I think it has more personality. Great Job!